The best way to send your body and mind the message that you plan to have a healthy day is by choosing a healthy breakfast. A great breakfast will jumpstart your metabolism, keep you satiated and energized for a morning workout, and give you something to get out of bed for! Try this High Protein Pancake recipe from The SOUPer Slim Diet ebook, and let it give your morning routine a kick in the pants. 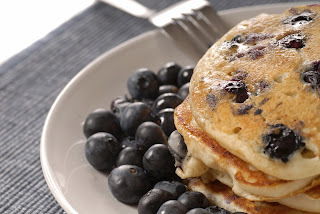 These pancakes freeze well individually for up to 4 weeks. 1. Spray large pan with cooking spray. Blend all ingredients together in large bowl until well mixed. Then, gently fold in blueberries being careful not to break the blueberries. 2. Place enough batter in pan to create a thin crepe, moving pan around until batter is evenly distributed. 3. Cook until light golden brown. Flip and lightly brown on other side. Serve with 1T sugar free maple syrup. Serving size: 2 pancakes (1/15 of the batter). Nutritional Content: 150 Calories, 4g fat, 6%, 0g sat fat, 14g protein, 15g carbohydrates, 14g fiber, 5 mg cholesterol, 110mg sodium. From The SOUPer Slim Diet eBook. To purchase the book click here.